This is the answer to all your paper towel woes, no more throwing away money. 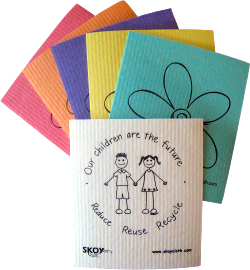 Skoy is an Earth friendly, all natural and biodegradable multi-use cloth. One Skoy cloth could potentially take the place of 15 rolls of paper towels! These are amazingly simple with no plastic overwrap to take off, they just come as they are. There were four colors in my package which makes excellent sense to me because then I can keep track of which one I am using where in my home. I decided to try the blue one in my bathroom tonight. As soon as I put this 7"x7" square under the water it was ready to go, the Skoy drank the water in fast (on their website it says these absorb 15x their weight in liquid) and there was no weird scent from it like a sponge has. The texture was like a sponge and microfiber cloth combined. The cloth was also non-abrasive so I bet it would work well to wash some pots and pans or easily scratched items. I got right to work on my bathroom sink with a very small amount of liquid dishsoap (I prefer it to clean my bathroom sink). I was able to squeak into very tight spaces in between the faucet handles, my sponge never worked there and paper towels just ripped up. I was so excited at how much crud I actually was able to scrub off of my sink with this amazing cloth. The textured sides make it easy to just wipe, no elbow grease was needed at all! I'm thinking of getting some to give to teachers at my kids' school, I bet they would be great for cleaning up all those crazy kid messes they encounter. Getting the Skoy wet so I can wipe that faucet clean of all those sticky kid prints! Scrubbing that grime away and getting into cracks I could not easily wash before! My sink is gleaming! Thanks Skoy, mama likes! Skoy was created by two moms, their vision was simple...create a cloth that would be more useful than the average sponge or papertowel while helping to save our environment. How long does a Skoy cloth last? A cloth could last anywhere from 3-6 months with normal use, like wiping the counter off a couple times a day or washing the highchair and kitchen table. Some people have been known to use one cloth for up to one whole year! Once it has been a few months you can "down-grade" it to be used for wiping lawn chairs and things in the garage. I have been using my Skoy cloth nonstop now since this review was written and it is still amazing! It has a few stains but it still working like new. I just rinse it out really well with some soapy water at the end of the day and hang it to dry. I pop it into the microwave for 1 minute every few days and we are good to go. How should you care for your Skoy cloth to make it last the longest? When you are done using it for the day just rinse it really well to be sure nothing is left on it then set it somewhere to dry. The great thing about Skoy is that they dry very fast thus keeping bacteria from growing like your ordinary sponge. After a couple weeks of use you can just "renew" it in the dishwasher or wash it with your laundry on the gentle cycle. If you feel the need to sanitize it just pop this baby wet into the microwave for a minute or two then wait a minute to pull it out. Want to buy Skoy? Skoy comes in a wide variety of fun colors, there is even a larger 10"x12" size! Prices are right around $7 for a pack of four. You can raise funds for your school with Skoy! Mama gives this item five out of five hearts! Special thanks to SKOY for mailing me this wonderful product to review.